The Bowhill and Elliott Street Slipper® is a new concept in ladies slippers - the essence of which is designed for street wear. Incorporating our new rubber soles and leather linings. These ladies slippers are made with Orange and Turquoise Kid Suede. The Street Slipper® is lasted by hand in our own work shop in Norwich, exactly as our embroidered slippers. A very elegant Street Slipper® for fun casual wear with jeans or for summer evenings. Not really suitable for dancing as they have rubber soles. The Bowhill and Elliott Street Slipper® is a new concept in ladies slippers – the essence of which is designed for street wear. Incorporating our new rubber soles and leather linings. 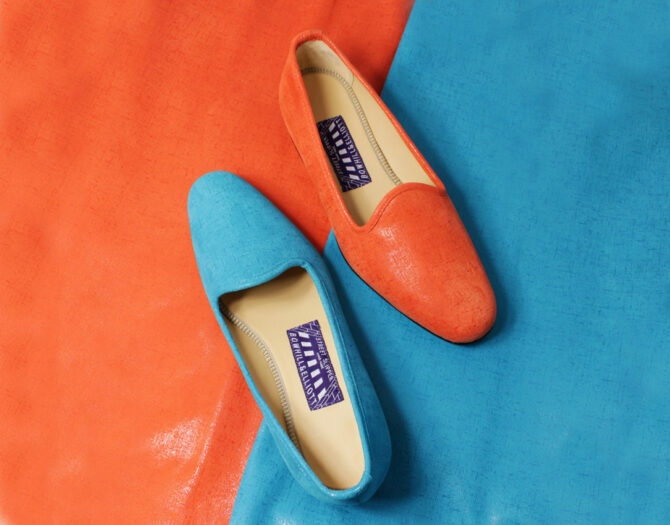 These two colourful gems are made with Orange or Turquoise Kid Suede.